LOVE OUR PLANET code gets you up to 20% extra FREE bespoke celebrate our 100% biodegradable pouch and stored in a tinplate pail. Traditional plastic supplement pots, bearing the recycle logo, still take 100's years to biodegrade and most are sent to landfill or exported and end up in the sea. 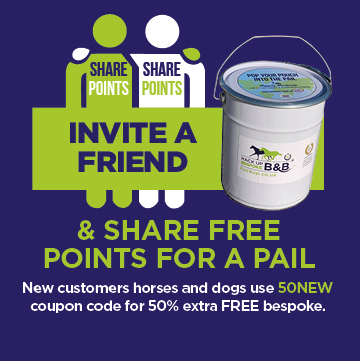 NEW customers and animals get 50% extra FREE product and FREE pail til 31.4.19. Powerful proven raw ingredients are blended without preservatives, fillers or sugars. With twenty-five years of bespoke formulating and manufacturing experience coupled with a lifetime of International horsemanship knowledge and heritage this bespoke innovation has been made possible. 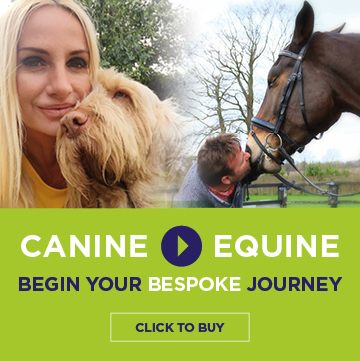 We create hand-made bespoke supplements for horses and dogs in our own dedicated Internationally approved factory, within minutes of receipt of your order, and deliver the next day. Initially, this bespoke digital option was designed for the most discerning owners, who wanted to have the opportunity to have input into their own animal's supplement nutrition and work with our formulators direct. Our dedicated digital journey began five years ago to make this service possible on a national and International scale. Creating an account gives you direct instant access to our team for FREE we are happy to talk to you about what issues or difficulties has made you reach out to us. You can also add photos and videos for us to store on your file to build a personal history of your horse or dog. Our products are all FREE from any restricted or forbidden ingredients at International manufacturing levels, making them completely competition safe at every level. Our products are highly effective and offer affordable solutions to many chronic conditions. As a complementary product gaining clinical science to prove what we know runs a risk of making us a veterinary supplied product - so we just trust what we know and what you will feel and see. Our team of three formulators is headed up by Alex Gingell, they are formulating and refining for 8 hours a day 7 day a week so be assured of a prompt response. 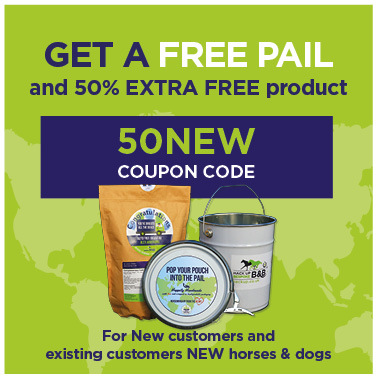 We formulate equine supplements for all types of horses from the pet to performance, joint supplements for dogs are now a firm favorite on many customers files. We are the leading bespoke equine supplement UK company and offer horse health products for almost every situation that is presented to us. We assess your story and talk to you, if we feel that a clinical view needs to be taken we will recommend veterinary assistance, we work with vets all the time and create bespoke for many vet horses.